Learn how to paint a farm house in the vineyards land of Chile. I was born and raised in Chile, and in my memories, I remember country roads, traveling with my family through the beautiful vineyards land in the foot hills of the Chilean mountains. 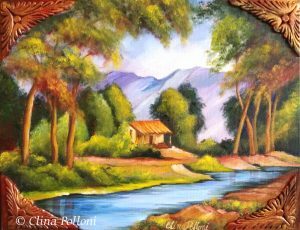 This painting is based in sketches that my great grandfather, Antonio Polloni did when painting the landscape of Chile in the 1800’s. Start by drawing the country houses and landscape. Give a soft coat of gold acrylic. Acrylics are very good for under-painting, they creates a worm color that once you paint in the top, the colors looks brighter. Next star painting from the back, sky, mountains, trees, house and creek with reflections in the water. Supply: This painting can be done in acrylics or oils. Oil Paintings: You can buy them at Hobby Lobby, Michael’s, ACMoore, but again the most affordable ones are at Jerry’s Arterama and their brand is LUKAS. Esta pintura esta inspirada por esta canción Chilena.